Sometimes the gods have no taste at all. They allow sunrises and sunsets in ridiculous pink and blue hues that any professional artist would dismiss as the work of some enthusiastic amateur who’d never looked at a real sunset. Pterry puts it beautifully when describing the pretty tasteless colours that make up the most beautiful on sunrises and sunsets. While they look stunning in real life, you wouldn’t really want to hang it on your living room wall, would you? 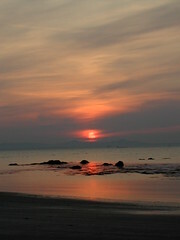 Photo taken at Yellowcraig Beach, between Gullane and North Berwick. Highly recommend all three beaches, along with Dunbar’s massive beach. All good for summer evening walks and flying kites, but still too cold to dip (unless you’re a masochist or die-hard surfer with an extra-thick wetsuit). Came across the strangest driftwood this evening.